This is the translation of an older article of mine, which was first published in German by the Meridian, Fachzeitschrift fuer Astrologie in 2012. 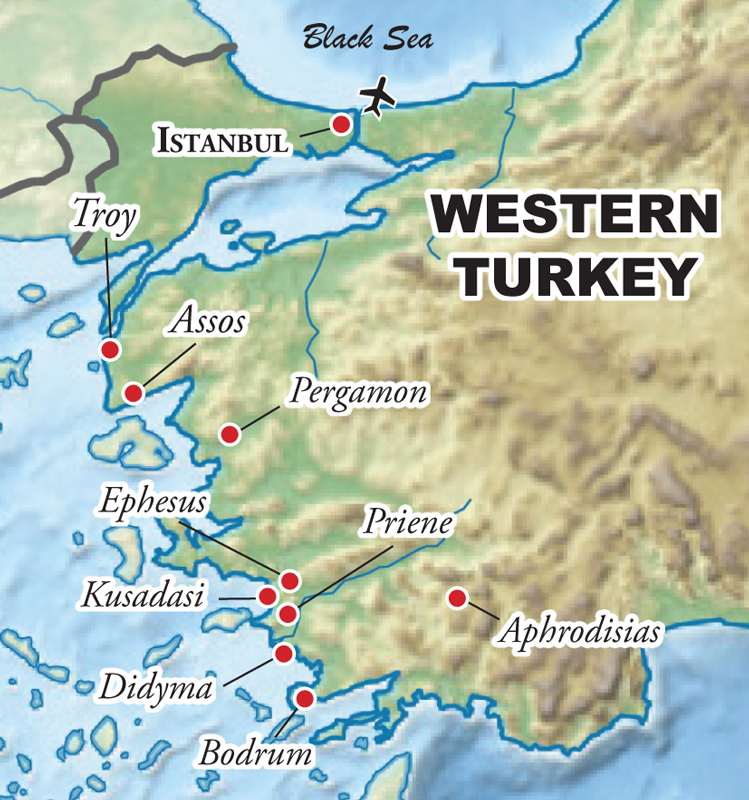 Claudius or Aelius Galenus was born in 129 B.C.E at Pergamon, the capital of the ancient region of Mysia, which corresponds nowadays to the Turkish Izmir province in Anatolia. Claudius’ father Nikon, a well established architect, initiated his son at the age of fourteen to the study of philosophy, covering the five main schools of his time: Peripatetics (Aristoteles), Plato, Epicurus and Stoicism. Galen also received classes in geometry and arithmetic. Nikon wanted to prepare his son for a career in the government services, but at the age of 16, Galen became interested in medicine, which had been suggested to his father in a dream. He believed very much in the dream messages and even wrote on this argument later in his life. He got initiated to the medical arts in the Asclepius temple, dedicated to the Greek God of medicine. Those temples functioned as spa or sanatoria to which the sick would come to seek the ministrations of the priesthood. After his father’s death, Galen spent some years overseas, studying in Smyrna with Pelops, in Corinth with Numisianos before settling in Alexandria, where he studied with Herakleianos, Stratonikos, Satyros or Lykos Julianos. Alexandria was famous for its faculty of Anatomy and Galen was fascinated by this discipline. In later years he wrote many books about anatomy and pathology. Alexandria claimed the world’s most famous library with probably over 700.000 titles and scholars are quite sure that Galen had access to volumes treating human pathology and dissection. But it still seems as if Galen never dissected personally humans, since the Roman law had prohibited them in 150 B.C. Probably it had become unconventional (for religious or ethical reasons) and thus difficult to practice them long before. This might explain why some of Galen’s deductions are simply wrong: he dissected many animals, mainly pigs and monkeys and reported diligently and very detailed observations. But those animals even if parented closely to humans (as the primates) still differ anatomically from them. He assumed, for example, that rete mirabile, a blood vessel plexus of ungulates, also existed in the human body. He furthermore did not recognize blood circulation, and thought that venous and arterial systems were separate. Beside his medical career, philosophy was fundamental for Galen: he was a master of medical philosophy, and considered the study of this art to be essential to a physician’s training. Philosophy enables the physician to discern between truth and illusion, or between reality and mere surface appearances, which is so important in diagnosis. He thus applied the thoughts of Aristotle and Epicurus to believe only in what he was able to see and to describe, following the Aristotelian doctrine that, in Nature, form follows function. If we want to understand the function of an organ, tissue or body part, we must first study its form. That’s why Galen considered anatomy to be so important. This approach reduces the significance of superstitious beliefs or religious concepts in favor of empirical research and a methodical approach in writing down his experiences. These may be the reasons why his works have been considered, for almost 2000 years the “non-plus-ultra” in medicine. It was believed that it wasn’t even necessary to verify Galen’s details. Since he wrote so much (lots of his writings got lost but about 200 titles are actually assigned to him) and in such detailed manner, it was supposed that he left nothing out. The therapeutes of Asclepius became he himself something similar to a God of medicine. And this remained the case until the Renaissance, when the first mistakes were discovered and the general consideration regarding health and natural healing power of the body radically changed. In 157 aged 28, Galen returned to Pergamon as physician to the gladiators of the High Priest of Asia, one of the most influential and wealthiest men in Asia. In the following four years he learnt about the importance of diet, fitness, hygiene and preventive measures, as well as living anatomy, and the treatment of fractures and severe trauma, referring to their wounds as “windows into the body”. In the year 162 Galen moved back to Rome. 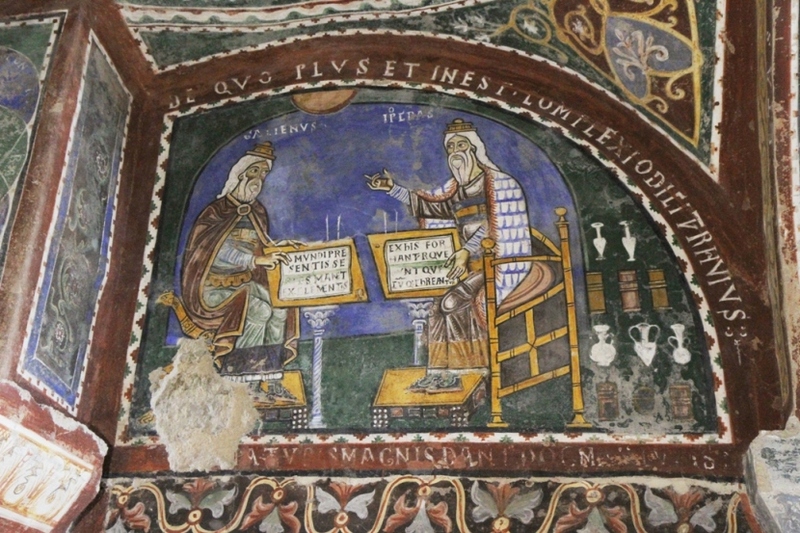 One of his patients was Flavius Boezius, a consul who introduced him to the tribunal where he became physician of the court of the imperator Marcus Aurelius. Successively he cured also Lucius Verus, Commodus e Septimius Severus. He spent all his life living in and working for the court, where he employed up to 20 writers annotating his thoughts. The date of his death is still subject to debate: the theories differ from 199 B.C. to 216 B.C. The poet Ibn Jubayr reports that Galen had interment in Misilmeri, close to Palermo in Sicily. Galen was a declared fellow of Hippocrates, who lived in 460 B.C- 370 B.C, about 600 years earlier than him. Galen developed and expanded the humoral physiology and pathology of Hippocrates. His chief contributions to the theory of Greek Medicine were his theories of the three varieties of pneuma, or vital energy, and the four faculties of the organism. and distributed by three types of vessels: veins, arteries, and nerves. According to Galen’s system, pneuma was modiﬁed by the liver so that it became the nutritive soul or natural spirits that supported the vegetative functions of growth and nutrition; this nutritive soul was distributed by the veins. The heart and arteries were responsible for the maintenance and distribution of innate heat and pneuma or vital spirits to warm and vivify the parts of the body. The third adaptation, which occurred in the brain, produced the animal spirits required. 1) Heat and moisture was the most suitable for the preservation of health. 4) Cold and dryness give rise to melancholy. Proper organ function was very important to Galen’s views on anatomy and physiology. He tended to view health as the balanced, harmonious, optimal functioning of all the organs and systems of the body. Every physical disturbance was considered a “dyscransy”, as a bad composition of the four bodily components and finally as “idiosyncrasy”, based on a natural hypersensibility for certain substances. Each of the four types of humours corresponded to a different personality type. The sanguine temperament personality is fairly extroverted. People of a sanguine temperament tend to enjoy social gatherings, making new friends and tend to be boisterous. They are usually quite creative and often daydream. However, some alone time is crucial for those of this temperament. Sanguine can also mean very sensitive, compassionate and thoughtful. Sanguine personalities generally struggle with following tasks all the way through, are chronically late, and tend to be forgetful and sometimes a little sarcastic. Often, when pursuing a new hobby, interest is lost quickly when it ceases to be engaging or fun. They are very much people persons. They are talkative and not shy. People of sanguine temperament can often be emotional. A person who is choleric is a doer. They have a lot of ambition, energy, and passion, and try to instill it in others. They can dominate people of other temperaments, especially phlegmatic types. Many great charismatic military and political figures were choleric. They like to be leaders and in charge of everything. They can be very manipulative. A person who is a thoughtful ponderer has a melancholic disposition. Often very considerate and get rather worried when they could not be on time for events, melancholics can be highly creative in activities such as poetry and art – and can become preoccupied with the tragedy and cruelty in the world. A melancholic is also often a perfectionist. They are often self-reliant and independent; one negative part of being a melancholic is sometimes they can get so involved in what they are doing they forget to think of others. Phlegmatic tend to be self-content and kind. They can be very accepting and affectionate. They may be very receptive and shy and often prefer stability to uncertainty and change. They are very consistent, relaxed, calm, rational curious, and observant, making them good administrators. They can also be very passive-aggressive. The natural condition of the human body was health and every physical infirmity was a disturbance of the balance of its four humors. Only on rare occasions his processor Hippocrates admitted the use of strong (medical) drugs. And he advised his patients not to feel punished by any God but to consider his own life-style and diet as a possible cause for physical disturb. Galen used those principles for scientific approach to anatomy but he made large use of natural medicine respecting, nevertheless, to “get the permission” of nature to help. This permission wasn’t given with sacrifices, but analysing scrupulously the chart erected on the moment when the patient first had fallen ill (decumbiture). In this way he calculated when the Moon or benefic Planets such as Venus or Jupiter were in positive aspect to the main significators of the decumbiture chart. the critical days consisted simply in the exact moments when the Moon entered in square, opposition or conjunction aspect to her own position of the decumbiture. Since those aspects traditionally indicate a crisis, for better or worse, he assumed that they had to show the outcome of the patient’s illness (whether to live or to die). In those moments the body was “struggling”. Galen further used the “judicial time” in order to elaborate an accurate prognosis. This time started when the Moon transited the succedent house cusp in relation to the decumbiture. On the other hand, the “helping” aspects as sextiles and trines were used for the administration of drugs or introduction of new therapies, as Galen interpreted the latter aspects as nature’s signal of accepting help from the (astrologically) instructed physician. 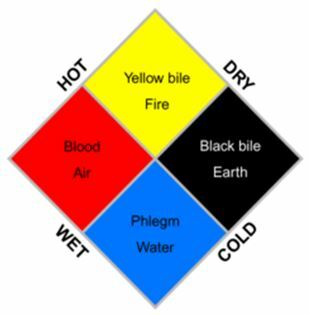 Beside his large use of the critical days, Galen’s four humors were the fundamentals for classical medical astrology because easily adaptable to the four elements, seasons, main aspects and horoscope-quarters. Since astrology was one of the faculties Galen judged strictly necessary for every physician, its use was one of the main arguments against his theories of his critics, mainly in the Renaissance up to our modern days. Nevertheless, his teachings kept fundamental for physician practice for almost 2000 years. In 1545 Flemish Andreas Van Wesel (also known as Vesalius) discovered that the blood circulation was separated for arterial and venereal blood. From the 17th century Galen’s theories started to fall in disuse. Today’s western physicians do not study anymore his texts and the main part of them hasn’t even been translated to modern languages. To our modern concepts about medicine, his doctrines may seem, at a first glance, antiquated. Western medicine doesn’t consider “soul-complications” in a physical disease, but takes the human body mainly as a machine which can be repaired, if necessary. This implies that a infirmity is described to develop equally in any body, nevertheless the differences in their constitution in the humoral sense. But if Galen’s concept were new to the Greek world and kept important until quasi modern times, they were not new at all in the East. On the contrary, Galen’s teaching compared to eastern medicine, especially the fundamentals of Ayurveda*, do not seem new at all. They appear as some kind of abbreviation of older and far more detailed humoral therapies. The similarities between Galen’s theories about the bodily humors, the critical days and his certainty that the natural state of everybody is health and a disease only the consequence of a bad or – for the personal constitution- incorrect life-style and the ayurvedic point of view, are at least amazing. Every body is composed, in different measure, of those three doshas. They vary with the age, life-conditions and life- style, in particular with the diet. With the help of an accurate diet, (not necessary in the modern sense of “reducing food” but meaning adequate food for a particular physical and psychical constitution), detoxification (as panchakarma or especial massages, for example shirodhara for the head) and the help of phytopharma, the patient can be brought into his natural (temporal) balance. 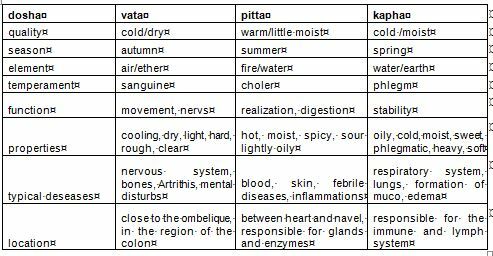 But still, Ayurveda is far more complex than it seems at a first glance. But what can be said, returning to Galen, is that this system knows about the associations of plants and humors (doshas) and those associations are surprisingly identical to Lilly’s, who took them from Arabic authors, who studied Galen for a longer period than the western part of the roman empire. On the other hand, Ayurveda is much older than Galen’s theories and it might be suspected that he had access to writings treating Vedic disciplines as they must have been known at his time. At his lifetime, the Caraka Samhitā, one of the oldest written documents about Ayurveda had already been composed ca. 400 years ago. Not much is known about the origins of this Indian medical practice. Ayurveda is certainly more than 4.000 years old and was transmitted for thousands of years exclusively in form of a certain kind of poems or a rhythmical speech (metrics). This kind of oral conservation made sure that it was practical impossible to change the content of those “strophes” because they would have lost their natural rime which guaranteed the originality of its context. Sure is that the Ayurveda has its roots in the Vedic Epoch of India. The long oral transmission of Ayurveda is the reason why the oldest text about it are known to be written long time after the “golden age” of Ayurveda. 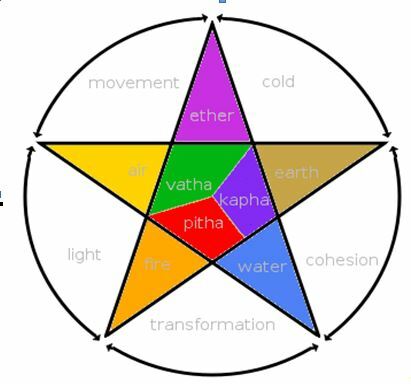 The similarities between Galen’s doctrines and Ayurveda are amazing. Ayurveda is still far more complicated and detailed as could bee analyzed in this article. In the western world we are more used to throw out of the boat everything which is believed un-modern in order to follow blindly the so called science, which believes only in what she’s able to see and to describe (a little as the Peripathetics) but which is a new-born child in comparison to the Millennia of Galen’s ideas or Ayurvedic teachings. The main difference between eastern (humoral) medicine and western interpretation of the art is the consideration of the human as a part of the universe, a microcosm in the macrocosm surrounding him. Western medicine tends to operate just on the micro-level forgetting about the rest. Galen in his world view was much more eastern than modern medicine could ever accept. Since Chinese, Tibetan and Indian medicine all teach Humoral therapy, it might be asked if the western world should not make an effort translating the teachings of Galen, among others, in order to understand deeper her own past but, even more important, her own future. The success of homeopathic medicine in the western world which is based principally on analogies between plants and diseases and the personal constitution, might be an example for the re-birthing interest in humoural studies and a much more personalized approach to the “why” of a disease and a tailor-made cure of it. * Melancolia, from Greek μελαγχολία – melancholia, “sadness”, literally black bile, also lugubriousness, from the Latin lugere, to mourn; moroseness, from the Latin morosus, self-willed, fastidious habit; wistfulness, from old English wist: intent, or saturnine, in contemporary usage, is a mood disorder of non-specific depression, characterized by low levels of both enthusiasm and eagerness for activity. * Sanskrit: आयुर्वेद; Āyurveda, “the complete knowledge for long life”; or ayurvedic medicine is a system of traditional medicine native to India and a form of alternative medicine. In Sanskrit, words āyus, meaning “longevity”, and veda, meaning “related to knowledge” or “science”. Galen wrote in Greek, at his time the natural language for medicine, even in the Roman period. They were translated into Latin but found also much acceptance in the eastern part of the Roman Empire, with Constantinople as its capital. In the Muslim countries Galen’s conviction of an only God helped much the large diffusion of his operas. Many of his writings survived to our days only in their Arabian translation. The earliest literature on Indian medical practice appeared during the Vedic period in India, i.e., in the mid-second millennium BCE. The Suśruta Samhitā and the Caraka Samhitā are great encyclopaedias of medicine compiled from various sources from the mid-first millennium BCE to about 500 CE.